First of all the Aelia Wedding Venue Nicosia is an escape from the boundaries of a conventional wedding venue within the borders of Nicosia. where serenity & tranquility meets style. Just like the sun entices you under its warm cocoon, Aelia has been designed as a wellness haven in the outskirts of Nicosia, Cyprus, to transport your body, mind, and spirit into pure bliss and serenity. With the sun as its primary energy source, Aelia’s décor harmoniously combines elements of wood and stone to create a tranquil retreat, which promises to heal, de-stress and invigorate. An eco-resort, which blends naturally with its pristine, natural surroundings, Aelia boasts a state-of-the-art spa for utter relaxation, eco-friendly accommodation, and a fine-dining restaurant. And, once you have explored what Aelia has to offer, you can take advantage of the full roster of activities from cycling to horse riding and cooking classes to wellness workshops. This boutique spa hotel, with its earthy tones, is transformed into a beautiful private wedding location. 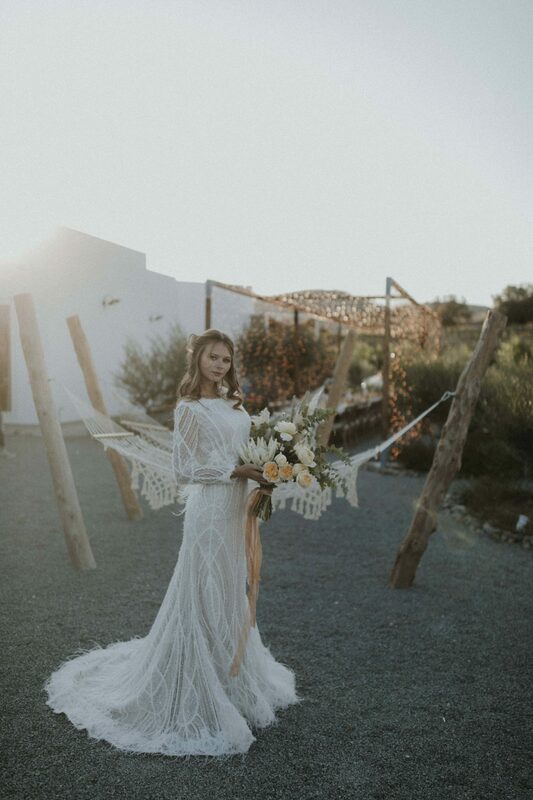 As the scorching summer comes to an end, it was the perfect inspiration for a Boho Desert Wedding. The setup for this shoot features a long wooden table with stunning amber glassware. 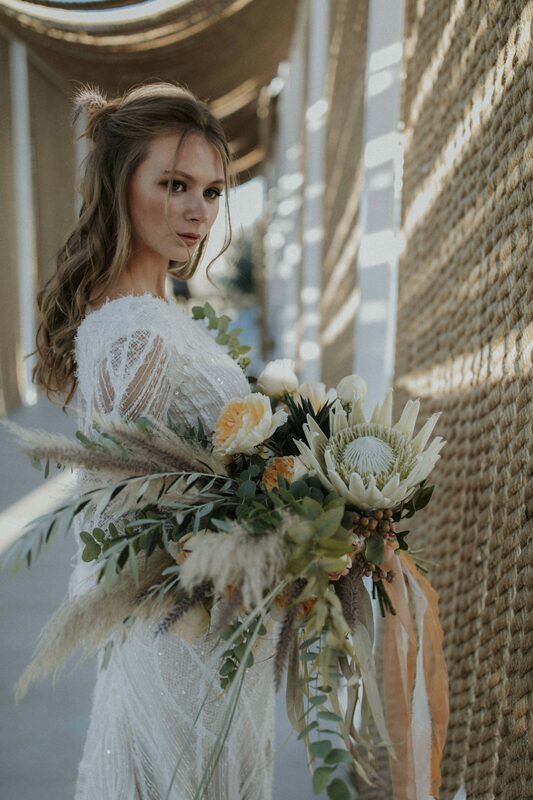 Gold cutlery, pampas grass, yellow Juliet roses, cactus plants & succulents that were all strategically placed underneath a shimmering tunnel of fairy lights. Using earthy materials and matching unconventional props such as antelope and deer antlers. Clear acrylic invitations are somewhat a little edgy yet totally stylish for brides who want to push the boundaries a little. Aelia Wedding Venue Nicosia for edgy unique style! The Retreat can cater for small intimate weddings to large-scale ones. The feeling is always intimate as the location is isolated within its natural landscaping and it gives you the feeling that you have escaped to your very own private villa. 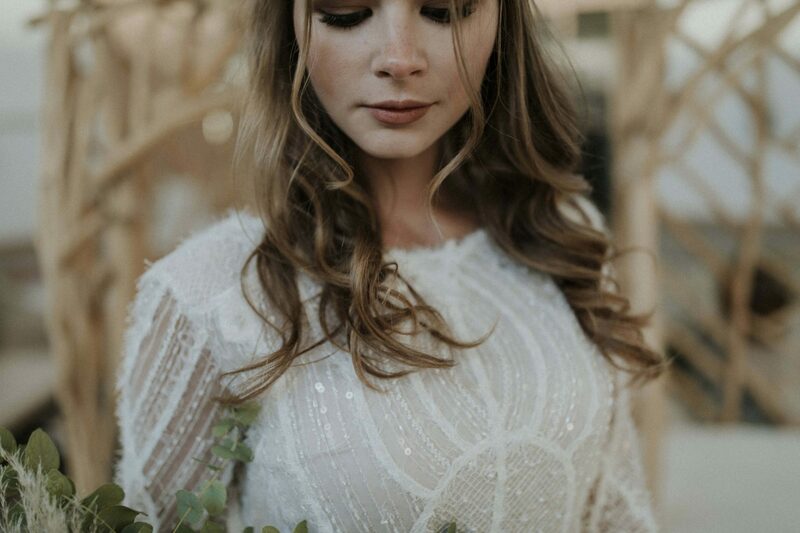 As always Lefki & Tina (The Event Co) who are Aelia’s in-house exclusive planners are there to help you design & execute your dream wedding with style!